Following a sell-out run at the Menier, the musical transferred to the Criterion Theatre last month where it broke box office records with the biggest advance in the venue's history. I am delighted to hear that Kyle Riabko's acclaimed show What's it all About? Bacharach Reimagined is to transfer from the Menier Chocolate Factory (where it finishes its run tomorrow, 5th September) to the Criterion Theatre from 3rd October to January 10th with a press night on October 15th. 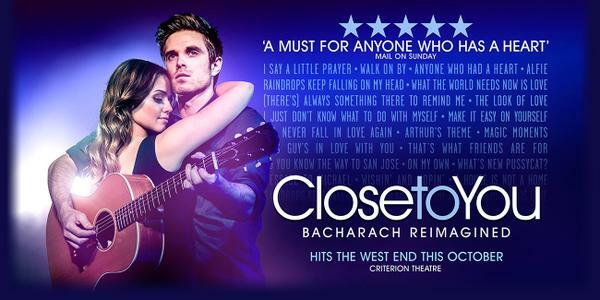 The show will be renamed Close to You: Bacharach Reimagined when it moves to the Criterion. Riabko created the 90-minute non-stop musical journey, where a group of young performers travel through Bacharach's classic melodies, blending nostalgia and innovation.The excellent score features Bacharach hits, including "Raindrops Keep Fallin' On My Head", "Alfie", "I Say a Little Prayer", "Close to You", "The Look of Love" and "Magic Moments". Riabko will reprise his performance in the West End, with further casting still to be confirmed. Rumour is that Anastacia McCleskey (credits include Broadway musicals such as VIOLET, THE BOOK OF MORMON, PRISCILLA and HAIR) is also on for the transfer. No word yet on whether the rest of the cast, including Daniel Bailen, Greg Coulson, Stephanie McKeon, Renato Paris and James Williams, will return for the London run. Close to You is directed by Steven Hoggett and has design by Christine Jones and Brett Banakis, costumes by Matthew Wright, lighting by Tim Lutkin and sound by Richard Brooker. It is produced in the West End by David Lane Seltzer for Entertainment 360.